Runners, walkers, and crawlers are invited to Savannah each winter to participate in the annual Savannah Bridge Run. Called the toughest bridge run in the south, the Savannah Bridge Run takes place above the Savannah River on the Talmadge Bridge. it is a beautiful route, no matter how you get across it. 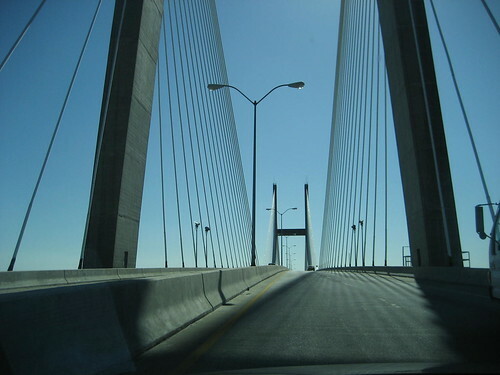 Run the Talmadge Bridge, which spans the Savannah River. The Savannah Bridge Run takes place Saturday, December 3, 2011. We still have an opening at one of our Savannah Vacation Homes. The Broughton Street Carriage House has one queen bedroom and one comfortable queen-sized sleeper sofa. It can fit up to four bridge runners, walkers, or crawlers. The Savannah Bridge Run can be either a 5K run, a 10K run, or a Double Pump (the 5K and 10K combined). The difference is all in how many times you cross the bridge. There is also a 1/4 mile Kids Run. Don’t let the lack of lodging prevent you from this fun run. Stay at the Broughton Street Carriage House, a luxury Savannah Vacation Home. Additional information about the race is available at Savannah Bridge Run.